See More Rooms and Details Book Now! The Gables is nestled in the middle of Philadelphia in a section known as University City. This is a residential community developed around the turn of the last century. It boasts an eclectic grouping of Victorian homes and Edwardian townhouses. The University of Pennsylvania, The University of the Sciences in Philadelphia, and Drexel University are all nearby as are the University Hospital, Children's Hospital, Presbyterian Hospital, Scheie Eye Institute and the Civic Center. University City's location makes it a neighborhood for people from all walks of life, many of whom not only live but also work in the area. Center City Philadelphia is only minutes away by easy public transportation that stops right in front of the house. Philadelphia's Convention Center, downtown shopping, museums and historic sites can all be reached in less than 15 minutes. 100% cotton, high thread count, sheets with embroidery and lace. All are ironed and starched for added crispness. A choice of down and feather or polyester fiber-filled pillows. Some rooms have working gas fireplaces. A full breakfast is served between 8 and 9:30 AM each morning. View. The time can be adjusted within reason with advanced request. Free off-street parking is available on the premises. The lot holds about 8 cars so parking is not guaranteed, but on a first come, first served basis. Free on street parking is available after 4:00 PM until 10:00 AM the next morning. Hours are unlimited from Friday at 4:00 PM - Monday at 10 AM. Monday-Friday daytime hours may have a posted 2 hours limit. Chester Avenue has a two hour limit during the day; for most of 45th and 46th Streets parking is unlimited. Easy public transportation stops right in front of the house and takes you in just minutes to the universities, Center City, the Historic District, and sports stadiums as well as the museums, shops and other places of interest. There is a computer station for guests to check and send e-mail. The house has wireless internet throughout. A pantry provides space for a common refrigerator stocked with spring water and other cold beverages and ice, a microwave oven, and an assortment of nibbles. A video and DVD library also is available for your viewing pleasure. Most rooms are equipped with a vcr or dvd player or both. You may pay for your stay upon arrival by major credit card, cash, personal check, traveler's checks or by official approved gift certificate. We accept gift certificates from The Gables, Bed and Breakfast.com, BnB Finder, and I Love Inns. NOTE: Prices are subject to change and should be verified at time of reservation. Any cancellations or changes to your reservation must be made by noon one week prior to your intended stay. Longer notice may be required during certain peak times and for special events such as UPenn Family Weekend, Graduation and holidays. If this is the case, you will be notified when placing the reservation and in an e-mail confirmation. Failure to comply with this cancellation policy will result in a charge for the full amount of the stay unless the room can be rebooked. We are not always able to be at home, so an estimated time of arrival within a two hour range is needed to make sure someone will be scheduled to be here to greet you when you plan to arrive. It is important to keep us informed of any changes in arrival time, earlier or later. Check out time is 11:00 AM unless other arrangements are made prior to departure. Prices include a full breakfast and free off-street parking is available in the driveway on the premises on a first come, first serve basis. If you choose to use public transportation during your stay, your car may be left until the morning of check out. Cars may not be left parked after check out without special permission. A roll away bed may be added to the Regent Room or the South Room for an additional $15. The roll away will not fit in any of the other rooms. Long-term stays are possible during certain seasons. Special rates are considered for these extended stays. A no smoking policy throughout the house is strictly enforced. Guests who abuse this policy will be asked to leave. Babies and young children can disturb other guests who are sleeping in adjacent rooms. Therefore, even though we love them, children under 10 should stay home with grandma. The Gables is at 4520 Chester Avenue, on the left at the end of the first residential block after the park. It can easily be recognized on the corner of 46th by the large wrap-around porch and glowing candles in the window. For convenient off-street parking, turn left onto 46th Street and left into the driveway behind the house. Walk through the side yard to the front entrance via the wrap-around porch to ring the front door bell. There you will be welcomed by the hosts. The #13 trolley of SEPTA's Green Line stops right out front of the house and is just 5 minutes to the University and 12 minutes to Center City and the historic district. By car it is about five minutes from the University Avenue Exit #346B off The Schuylkill Expressway, Route 76 From the exit, head toward The University of Pennsylvania on 34th Street/University Avenue. Pass under a pedestrian overpass and get in the lanes marked for Baltimore Avenue. You will be making a left hand turn and stay in the left lane marked for Woodland Avenue. Follow Woodland past the cemetery and trolley station, in a few blocks you see Chester Avenue split off to the right. Continue on Chester through Clark Park. See the links below for directions from specific locations. 1 Liberty Shuttle: After you pick up your luggage in the baggage claim, call Liberty Shuttle at (215) 724-3333. The cost of the shuttle is $12 per person and it runs between the hours of 5:30 AM and 11:00 AM. It is approximately a ten minute ride from the airport. Some times the shuttle must make stops at other hotels for other passengers. If you are not necessarily in a hurry it is the most economical means to get to and from the airport. 2 R1 Train: The R1 train to and from the airport costs $5 one way. It makes a stop at the University and in Center City. It is convenient for those locations, but not convenient if you are coming directly to the inn to check in and drop off your luggage. A cab from the train station to The Gables will run approximately $8-10. 3 Taxi: A taxi will cost $25-30 and may be more convenient. If there are two of you coming to The Gables, for a few dollars more it really makes more sense to take a cab. 4 The Gables is located at 4520 Chester, the corner of 46th Street and is easily recognized by its red brick exterior, large wrap-around porch and candles in the windows. 1Pick up your car at the rental company and leave the airport area via route 95 North. Immediately you will see signs for route 76 West. Follow these signs and get on 76 West. 2Exit from the right at #346B Grays Ferry Avenue/University Avenue. 3Bear straight ahead toward the Universities. When you get near the hospitals you will pass under a pedestrian bridge marked Veteran Affairs/Medical Center. 5When you turn, be sure to stay in the left lane marked for Woodland Avenue. After the traffic light you will pass a cemetery on the left and trolley station on the right. 6Proceed past Woodland Terrace to the fork in the road. You want to bear right onto Chester Avenue. The Gables is at 4520 Chester Avenue. You want to go to the fourth stop sign and turn left onto 46th Street. The Gables is on the left corner at 4520 Chester and is easily recognized by its red brick exterior, large wrap-around porch and candles in the windows. 7For convenient off-street parking please use The Gables' driveway which will be on your left after you turn onto 46th Street. 8From the driveway, walk through the side yard and up onto the porch, around to the front door. Ring the doorbell and you will be welcomed by the hosts. 1Take route 76 East. When you approach Philadelphia the road divides into 676 and 76. Stay on 76 East heading toward the Philadelphia Airport. 3Bearing straight ahead toward the Universities. When you get near the hospitals you will pass under a pedestrian bridge marked Veteran Affairs/Medical Center. 3After getting on 76 West, exit from the right at #346B Grays Ferry Avenue/University Avenue. 4Bear straight ahead toward the Universities. When you get near the hospitals you will pass under a pedestrian bridge marked Veteran Affairs/Medical Center. 5After you pass under this bridge you want to turn left at the third light toward Baltimore Avenue. When you turn, be sure to stay in the left lane marked for Woodland Avenue. After the traffic light you will pass a cemetery on the left and trolley station on the right. 7For convenient off-street parking please use The Gables' driveway which will be on your left after you turn onto 46th Street. From the driveway, walk through the side yard and up onto the porch, around to the front door. Ring the doorbell and you will be welcomed by the hosts. 1Follow the New Jersey Turnpike South to exit #5 Burlington/Mount Holly. 2After the toll turn left toward route 295. Pass the Burlington Shopping Mall about one mile to Route 295 South. 3Continue on 295 for 20 miles and watch for signs for Philadelphia, Route 76 West, The Walt Whitman Bridge. 4Go over the bridge and stay on 76 West. Exit from the right in about 3 miles at #346B Grays Ferry Avenue/University Avenue. 5Bear straight ahead toward the Universities. When you get near the hospitals you will pass under a pedestrian bridge marked Veteran Affairs/Medical Center. 7When you turn, be sure to stay in the left lane marked for Woodland Avenue. After the traffic light you will pass a cemetery on the left and trolley station on the right. 8Proceed past Woodland Terrace to the fork in the road. You want to bear right onto Chester Avenue. The Gables is at 4520 Chester Avenue. You want to go to the fourth stop sign and turn left onto 46th Street. The Gables is on the left corner at 4520 Chester and is easily recognized by its red brick exterior, large wrap-around porch and candles in the windows. 9For convenient off-street parking please use The Gables' driveway which will be on your left after you turn onto 46th Street. 10From the driveway, walk through the side yard and up onto the porch, around to the front door. Ring the doorbell and you will be welcomed by the hosts. 1Take Route 95 South following the signs for Philadelphia. As you approach the city there will be an exit marked 676 West, Central Philadelphia. Follow these signs. 2Stay on 676 West for about 2 miles to 76 East. This is marked for the Philadelphia International Airport. Get on 76 East for just a short distance, less than 1 mile. 3Exit from the right at #346B Grays Ferry Avenue/University Avenue. 6When you turn, be sure to stay in the left lane marked for Woodland Avenue. After the traffic light you will pass a cemetery on the left and trolley station on the right. 7Proceed past Woodland Terrace to the fork in the road. You want to bear right onto Chester Avenue. The Gables is at 4520 Chester Avenue. You want to go to the fourth stop sign and turn left onto 46th Street. The Gables is on the left corner at 4520 Chester and is easily recognized by its red brick exterior, large wrap-around porch and candles in the windows. 8For convenient off-street parking please use The Gables' driveway which will be on your left after you turn onto 46th Street. 9From the driveway, walk through the side yard and up onto the porch, around to the front door. Ring the doorbell and you will be welcomed by the hosts. 3At the Mid County Toll stay on 476 South and watch for signs for Philadelphia/Valley Forge. Get off at the exit marked for Philadelphia Route 76East. This is also known as the Schuylkill Expressway. 4Stay on 76 East for nearly 20 miles. When you approach Philadelphia the road divides into 676 and 76. Stay on 76 East heading toward the Philadelphia Airport. 5Exit from the right at #346B Grays Ferry Avenue/University Avenue. 6Bear straight ahead toward the Universities. When you get near the hospitals you will pass under a pedestrian bridge marked Veteran Affairs/Medical Center. 8When you turn, be sure to stay in the left lane marked for Woodland Avenue. After the traffic light you will pass a cemetery on the left and trolley station on the right. 9Proceed past Woodland Terrace to the fork in the road. You want to bear right onto Chester Avenue. The Gables is at 4520 Chester Avenue. You want to go to the fourth stop sign and turn left onto 46th Street. The Gables is on the left corner at 4520 Chester and is easily recognized by its red brick exterior, large wrap-around porch and candles in the windows. 10For convenient off-street parking please use The Gables' driveway which will be on your left after you turn onto 46th Street. 11From the driveway, walk through the side yard and up onto the porch, around to the front door. Ring the doorbell and you will be welcomed by the hosts. 1If you are convenient to Route 322 or 202, you will want to head south until you intersect with route 95. Get on 95 North heading toward Philadelphia. 4Bearing straight ahead toward the Universities. When you get near the hospitals you will pass under a pedestrian bridge marked Veteran Affairs/Medical Center. 1Another way from the Brandywine is more direct using city streets rather than the interstates. 2Take Route 1 North. Shortly after you pass the Riddle Hospital and Granite Run Mall the road divides. Follow the signs for Media, you do not want the sign for Philadelphia. Instead you will want to go straight through the town of Media. 3Keep on this road (Baltimore Pike) for about 15 miles. You will pass numerous malls and stores and traffic lights. Just keep going straight into the city. 4At 46th Street turn right. You will pass through one traffic light at Springfield Avenue and then come to a stop sign at Chester Avenue. The Gables is across the street to the left, on the corner. 5Continue on 46th Street and turn left into the driveway. 6After you park the car, walk through the side yard and up onto the porch, around to the front door. Ring the doorbell and you will be welcomed by the hosts. 1Head toward Philadelphia using Route 3 East (Market Street in Upper Darby) When you get to the city limits you will be under the Elevated Rail. Turn right, continuing on Route 3, onto 63rd Street/Cobbs Creek Parkway. 2At the next light, turn left onto Chestnut Street. Follow Chestnut Street for almost 2 miles. At the Texaco Station, turn right on 46th Street. 3Stay on 46th Street for about 8 blocks, pass through this 5 point intersection at Baltimore, staying on 46th Street. You will pass one more traffic light at Springfield Avenue. The next intersection is a stop sign at the corner of 46th and Chester. 4The Gables is across the street to the left, on the corner. 1You may want to take a taxi for about $8, or you my use the Green Line "trolley" (subway) which can be found on Market Street right in front of the station for $2.25. Look for the "Green Line" stairs going down to the subway heading Westbound. There are 5 trolleys that run on the Green Line, and you want to catch the #13 trolley ("Chester Avenue.") Get off right in front of the house at 46th Street, six blocks after the trolley comes above ground. The total travel time from 30th Street Station should be about 5-10 minutes. 1You will arrive at the Bus Terminal in Center City. Find the Green Line Subway one block south of the terminal on Market Street near 12th or 13th Streets. Head Westbound on the #13/Chester Avenue trolley. Get off right in front of the house at 46th Street, six blocks after the train comes above ground. Your total travel time from Center City should be about 15 minutes. A taxi from Center City will be about $12-$15. The Gables was designed and built in 1889 by prominent Philadelphia architect Willis Hale and became the home of Dr. Egan and his family. After the doctor's death in 1901, his widow made an extensive renovation of the home, probably eliminating his offices. It was passed on to a second generation of Egans, their daughter who was married to a Broadway show producer. When she died in 1936, the home was willed to the Catholic Church. The Church renovated the home to become a boarding house for the elderly. In the 50's the use changed to accommodate a group of laywomen known as "The Grail." Then in the mid 60's the Jesuits moved in and extensively renovated the home again, taking out the Victorian influences and "modernizing." Their modernization included wall to wall carpeting, fluorescent lighting, painting much of the cherry woodwork, and even building walls where walls never existed. In 1991 a local real estate agent and her husband purchased the home from the Jesuits with the idea that a bed and breakfast would be good for the neighborhood. It would also be a way to restore and save this beautiful edifice. 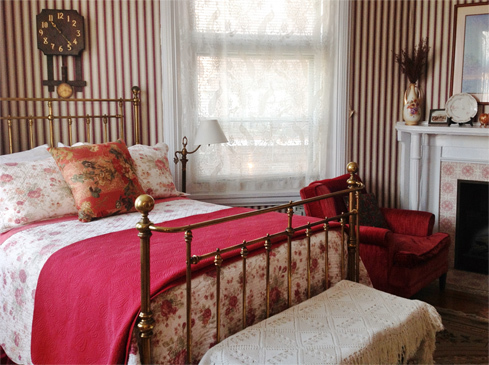 The previous owners, Don Caskey and Warren Cederholm, bought the home in 1993, continued the restoration of the home and created one of the finest bed and breakfasts in Philadelphia. In October 2016, the legacy of The Gables continued with the new owners and innkeepers. Guests are often found sitting on the magnificent wrap-around porch or in the garden reading the morning paper or perhaps a good book selected from the many available throughout the house. The yard with its ever-blooming perennial garden is a favorite spot shaded by a stately old Norway maple and blossoming dogwood, Japanese cherry, crab apple and magnolia. The home features natural chestnut and cherry woodwork throughout the first-floor parlors, dining room, and entrance foyer. Each room has oak floors with remarkable inlay of mahogany, ash, and cherry. Deep rich gemstone colors have been chosen for the walls to accentuate the woodwork. Some rooms are finely adorned with true Victorian stenciling, others with exquisite period wallpaper. An extensive collection of fine antique furniture from the late 19th century, plush oriental carpets, and minute detailing create a rich treasure for the eye in each room of the house. Guests are taken back to the beauty of the Victorian era while at the same time they can enjoy 21st century comfort of new bathrooms, cable television, internet access and much more. The gleaming oak floors with inlays invite guests into the warm, welcoming rooms. Oriental style carpets accentuate the rich pallet of color chosen for the walls. Each guest will be delighted in the comfort and beauty of the lavishly furnished and sparklingly clean rooms. Most rooms have private baths and some even have working gas fireplaces to add an ambiance of romance. The owners and innkeepers Rick, Cesar, John, Jose, and Jeannette are dedicated to making your stay in their home as comfortable and gracious as you might expect when you step back into the era of Victorian Splendor. Lastly, we are forever indebted to the generosity of Don, Warren, and Oscar. Check out our reviews on bedandbreakfast.com and tripadvisor!